The deep wrinkled ribs and burnt orange color makes this variety quite unique and an attention grabber. The handle is firmly attached on this 14 to 18 lb. pumpkin. Mrs. Wrinkles is bound to be a big hit for fall ornamental sales. Large, blocky, burnt orange fruits are just a little shorter than Mr. Wrinkles at 9 inches tall by 10 inches wide and weigh 14 to 18 pounds. (F1) Deep ribs, big size. Deep orange colour and strong handles. 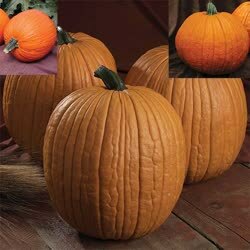 Mr. Wrinkles is very productive and has lots of character, giving it an old time pumpkin appearance. 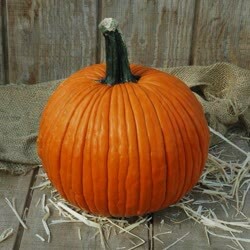 Barrel shaped 25-35 lb pumpkins are borne on strong indeterminate vines. Matures in 100 days. 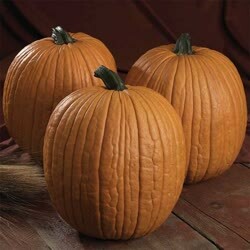 Wrinkled pumpkins for extra-spooky jack o'lanterns. 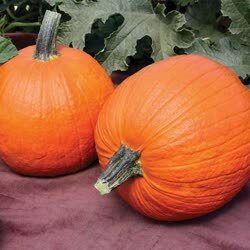 The big, barrel-shaped 20 to 30 pound pumpkins are deep orange in color, their shells heavily creased with deep wrinkles that add lots of character. 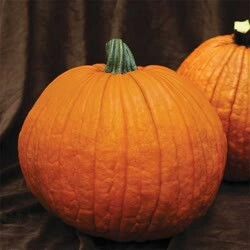 The pumpkins are generally taller than wide, averaging 13 inches tall by 10 inches across. Their thick flesh has very good flavor. Dark green, 5 inch handles are deeply embedded. Strong, indeterminate vines are very high-yielding. (F1) Dark orange, rounded fruits have wrinkles just like Mom and Pop but only average 5 to 7 pounds each.